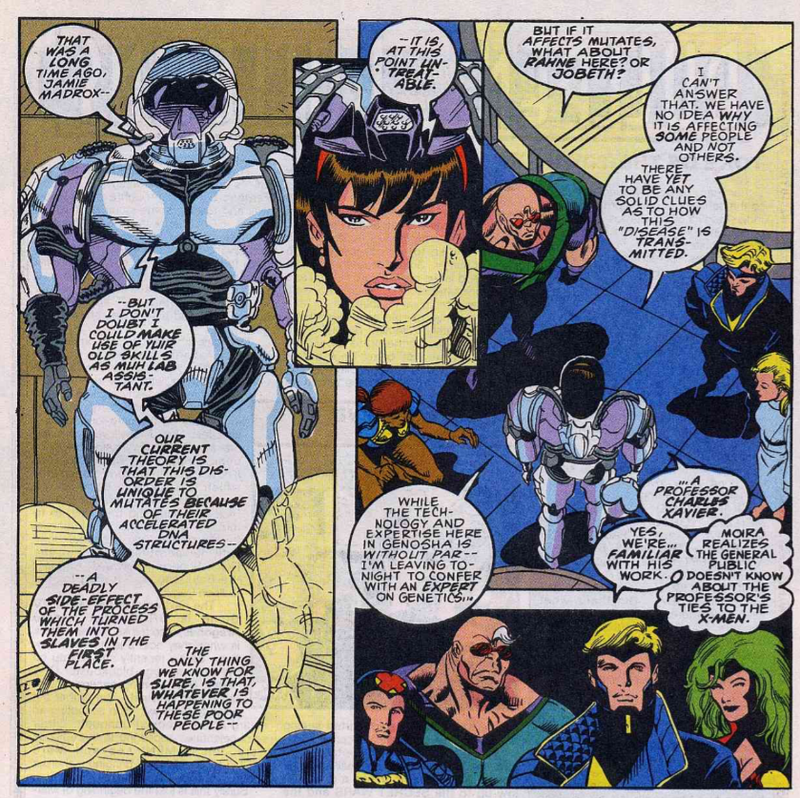 "A Green and Tender Place"
X-Factor learns of a new threat in Genosha. 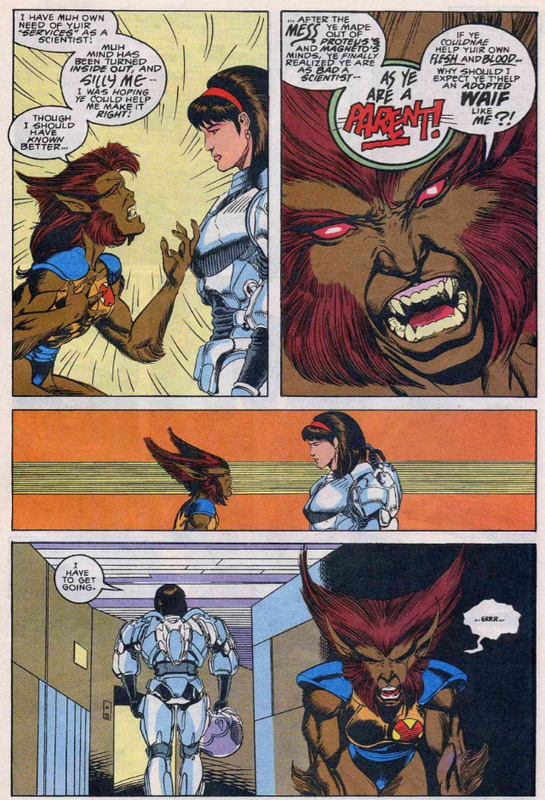 Wolfsbane attacks Polaris, angry upon learning the way her mind has been tampered with, but Polaris manages to calm her down by calling on her own experiences with mind control. 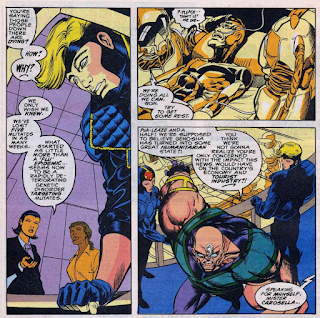 Elsewhere, Havok, upon learning of the Genoshan government's continued manipulation of the Mutates, battles the President's mutate bodyguard, until the President agrees to show X-Factor the truth behind the current Genoshan situation. 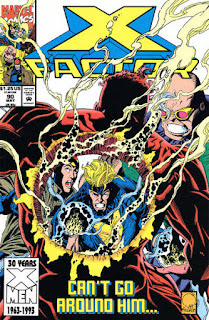 Over the Genegineer's objections, the President proceeds to take X-Factor to an abandoned hospital where doctors, including Moira MacTaggert, have been secretly working to fight a disease targeting mutants, to which the Mutates are especially susceptible. As they discuss the situation, one of the Mutates, not wanting to die in the hospital, escapes into the tunnels beneath the building. The President orders the Magistrates to find and kill him, but Havok interjects, declaring that X-Factor will track him down and bring him back alive. Scott Lobdell takes over as the series' writer with this issue, though his involvement was, presumably, always meant to be temporary; he writes this issue and the next, then hands over scripting duties to J.M. 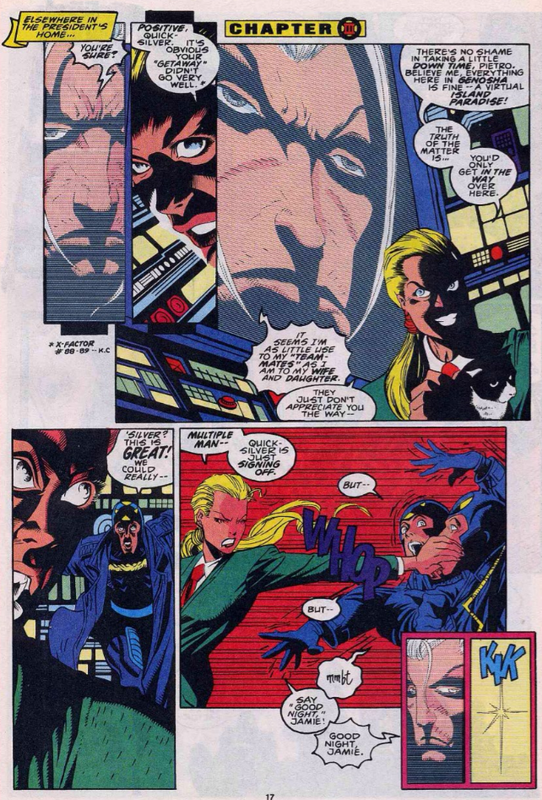 DeMatteis with issue #92, remaining on solely with a plotting credit through issue #95 (after which DeMatteis takes over fully). Joe Quesada pencils about half of this issue, with Buzz (real name: Alrdin Aw) taking over to finish it out, the third consecutive issue Quesada hasn't pencilled in full (though at least the previous two featured a more formal break in the form of the Quicksilver/Crystal story). This issue reveals that the Legacy Virus (still not called that directly on-panel) has reached Genosha, and is particularly active amongst the Mutates (due to their already-unstable genetics), functioning as a full-on plague. It's also said that Moira has been working with the Genoshan government to study and attempt to treat the virus, experiences referenced in Uncanny X-Men #300's second story. 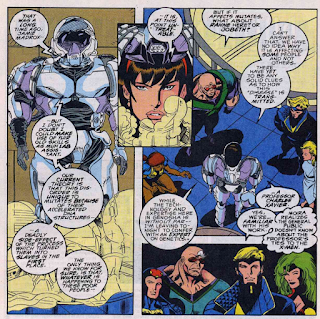 Moira leaves Genosha this issue to rendezvous with the X-Men (with her capture by the Acolytes happening off-panel between this issue and Uncanny #300), and her treatment of Rahne in doing so is particularly out-of-character - she insists that the larger issue of the Legacy Virus and the Acolytes outweight Rahne's problems at the moment, and while that may be true, she makes this argument in the most dispassionate and cold way, which rings especially false given how eager she was to help Rahne deal with her problems in the previous issue. Havok battles a mutate named Piecemeal this issue, his first and only appearance. In a neat trick, Polaris' new costume is shown to be at least in part metallic, as she's able to use it to deflect Rahne's physical attack. 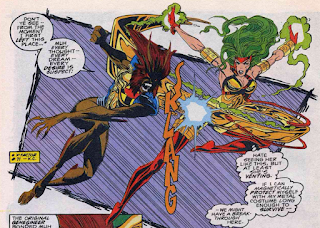 Polaris calls on her own history of mental control.manipulation to break through to Rahne, pointing out her stints as a thrall of Mesmero, Erik the Red, and Malice. 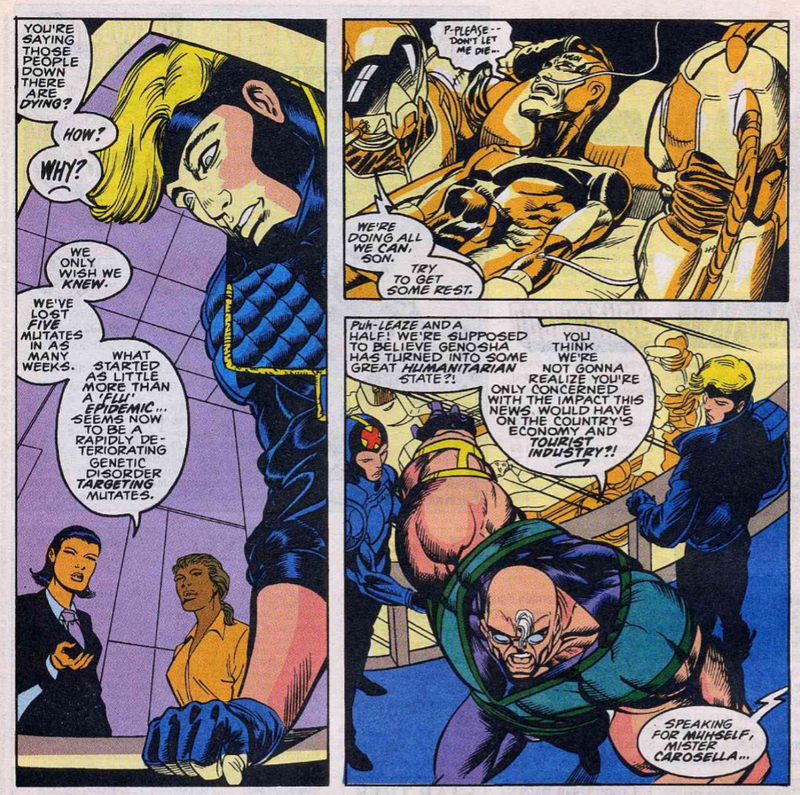 The "Evil Val" subplot continues, with Val turning down Quicksilver's offer to join the team in Genosha now that his reconciliation with Crystal has failed, then raging at Madrox for almost contradicting her. It's said that in the wake of "X-Tinction Agenda" (called "Extinction Agenda" by the Genoshan president, which, it seems odd they'd use the title of the story as a label in-universe), a UN council enforced some kind of regulations on Genosha. X-Factor plays along with Moira, downplaying Xavier's connection to the team, which Havok's thoughts helpfully explain to any confused readers. With Peter David gone, Scott Lobdell steps in to shepherd the title for a bit, and for the most part, he does a pretty good job of following in David's shoes, at least in terms of dialogue and characterization, peppering the script with a reasonable approximation of David's banter, and making a smart connection between the recent revelation involving Rahne's obsession with Havok and Polaris' own (long) history of mental manipulation. This series will never again be quite as funny (or punny), nor as character-driven, as it was under David, but Lobdell helps effectively smooths the transition here. 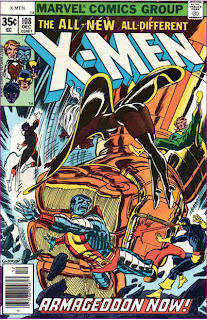 But plot-wise, he takes a sharp turn away from whatever David was building towards in the team's visit to Genosha, effectively ending the X-Patriots storyline (they are mentioned, but don't appear, and won't ever again) and turning X-Factor's trip into a way to build up the larger Legacy Virus storyline unfolding in Lobdell's other titles. It's a little sloppily-executed (Moira disappears from wherever Wolsfbane & Polaris are between issues, only to turn up again at the end of the issue to act hideously out of character), but it's not a bad turn, certainly (the X-Patriots were largely duds of characters anyway, with the best stuff to come out of this Genosha trip in the first place tied to Havok & Wolfsbane). It does, however, mark a shift in the series. 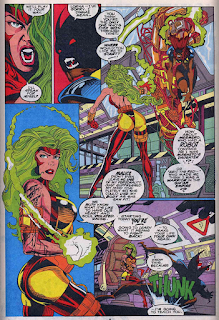 While never quite as isolated from the other X-books as, say, Excalibur, this book has nevertheless stood somewhat apart, in terms of tone and - "X-Cutioner's Song" and MLF-appearances aside - plot since the relaunch. With David's departure and Lobdell stepping in as plotter (along with another crossover event looming), for better and worse (and it really is a little of both), that mostly ends here. Tomorrow, Wolverine fights dinosaurs in Wolverine #69. Next week, Cable #1! The title harks back to UNCANNY #235 and its title "A green and pleasant land". And lol at Alex's enthusiastic "--to BLAZES with anyone--!" and the following subdued exchange with Lorna about "Blazes?!" "You know what I mean!" The Outback era Alex certainly used that a lot, for the out-of-universe Code-related/policy reasons. There's certainly an amount of claws in the "If you think I'm going to leave Genosha -- what's more, leave it standing... you've got me confused with another Summers!" Remembering the end of the original Genosha story with Havok blasting the Citadel, and subsequent X-Tinction Agenda this is both an apt reaction, and maybe not a little amount of meta slipped in. Like, Claremont's late run Havok was essentially the Plan Omega/Outback Havok, and at least he seems to have bought into the whole 'proactive' approach the X-Men was supposed to be about but of which there wasn't too much evidence in the end. The "90's reset" X-Men that emerged from the "X-Tinction Agenda" utterly discarded the idea and went to live in a mansion owned by the bald dude. Thinking of it, Alex totally should have emerged as the revolutionary from the Siege Perilous, as initially planned, to match the realized dreams/self-portrayals of star and painter of Alison and Peter. What fun he ends up with a government lapdog job. And sorry about my piecemeal dropping of notions, but I don't see Moira necessarily being out of character. Yes, there is dissonance from the previous issue, but in-between Moira has also had come to realize that she's now facing the biggest challenge by the sheer potential magnitude in her medical genetist career. There's sadly any amount of kids who get blown off by parent, who has promised them some together-time but then yet another career/responsibilities situation arises and off goes the plans. The theme's really been there since X-FACTOR #1. It actually has a plenty of story potential for going forwards, with Rahne looking for mother-figure/companionship and Moira having to come in terms with the ruthless and accurate accusations by Rahne. What is Moira exacty, btw? She's noted to be a Nobel-awarded geneticist abd mutation expert, but Mutant Massacre, Muir Island assault, this story here has seen her acting in a straight doctor-role, a surgeon even. "It's said that in the wake of "X-Tinction Agenda" (called "Extinction Agenda" by the Genoshan president, which, it seems odd they'd use the title of the story as a label in-universe), a UN council enforced some kind of regulations on Genosha." I believe they say in Claremont/Lee's X-Men #2 that the intelligence community has code-named the Cameron Hodge affair as "X-Tinction Agenda" (complete with "X-") so presumably Lobdell is just following on from that reference? Polaris using the metal in her costume in combat (or whatever) is pretty interesting. Other than assembling the chain mail of his outfit around him — which itself was a nifty concept and visual — back in #150, I don’t recall Magneto ever pulling a similar trick. Keeping some of the material you can manipulate on hand for offensive and defensive use just makes sense, even if it’s a common substance in most settings. There was #275 where Magneto used the iron (?) in freshly murdered Zaladane's blood for forming his villain outfit in fashion similar to #150. Which, now to think of it, is kind of Meaningful. But other than that, it's probably something to do with female comicbook characters being more inclined to shred their clothing.